Female animals do not have names ending in -o. For them, change the -o to -a. Male animals can have names ending in -a, when the animal name ends in -a. The word for fish - pez - is special. If you want to say that you have more than one fish, you have to change the letter z to c. You'll see later on that this rule applies to all words that end in -z. To say that you have one pet, use the word un(a). You'll use the word for I have - tengo. I have a (female) dog. Tengo una perra. I have two cats. Tengo dos gatos. I have fishes. Tengo peces. I don't have any. No tengo. Do you have pets? 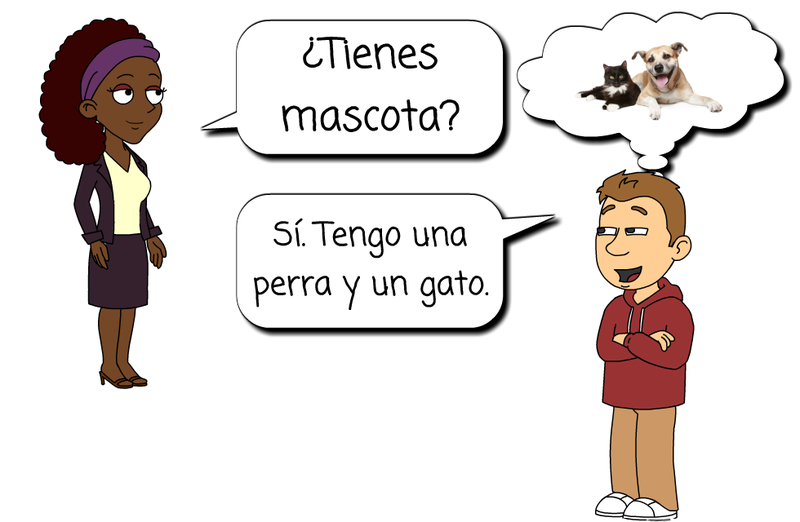 ¿Tienes mascotas? How many pets do you have? ¿Cuántas mascotas tienes?